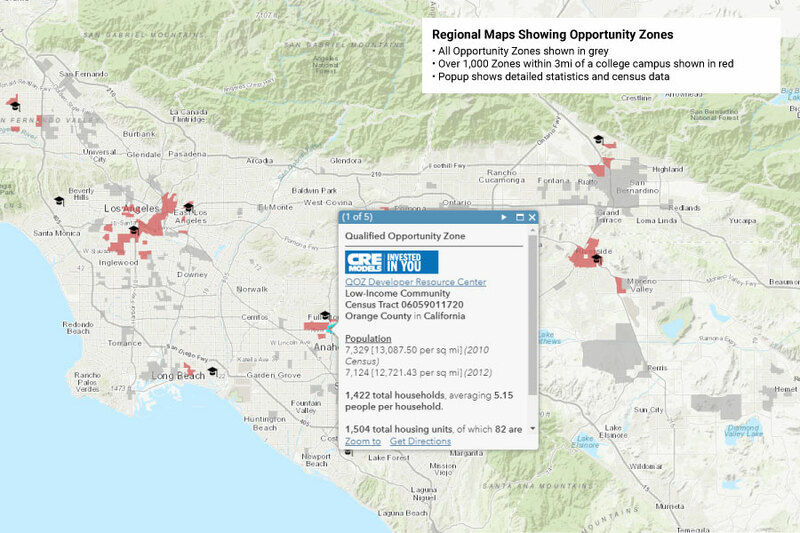 Specific asset classes have the potential to benefit from Opportunity Zones, Student Housing is one of the first that come up. This is because college towns tend to have high-density populations of students who are intentionally unemployed while attending school full-time. 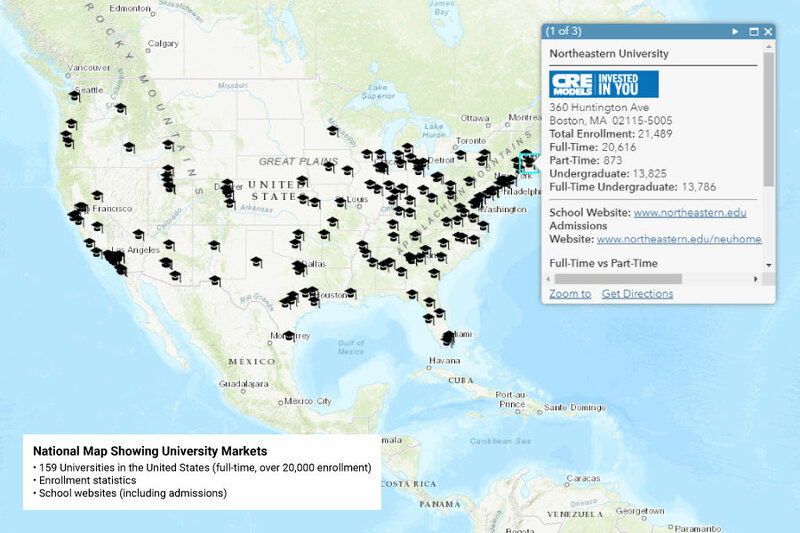 In many cases, these colleges are expensive to attend and the student population is not actually in economic distress, but because the income levels are skewed downward by the large number of full-time students, they can present an interesting situation for developers of student housing properties. The map below helps illustrate these potential locations. The map below shows all universities in the United States, along with all Opportunity Zones in grey. The Opportunity Zones within 3mi of campus are shown in red. 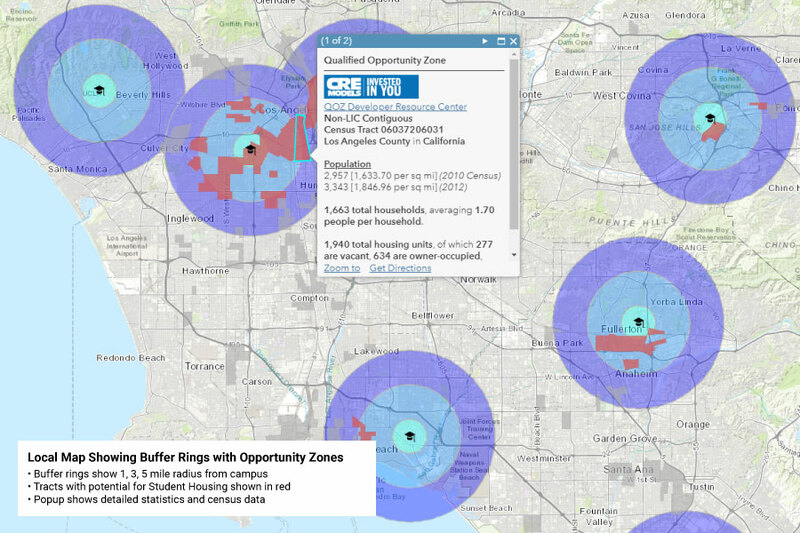 This is an improvement over the previous version, which only showed the Opportunity Zones within 1mi of campus. Most Student Housing is located within one mile of campus, however the university locations are currently points, not campus boundaries, so a 1mi radius may exclude areas that are actually within 1mi of the edge of campus. To illustrate this, we also added buffer rings showing 1, 3, 5 mile radii. Clicking on the university will show you some detail, as will clicking on the census tract. Feel free to share any feedback you have or data you would like to see added to oppzones-student@cremodels.com. Subscribe to our blogs to get updates on Opportunity Zones and other topics relevant to real estate developers and investors.